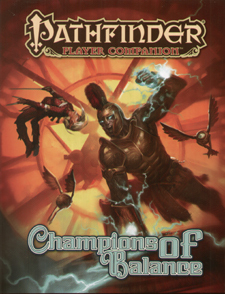 Whether you fight for law, chaos, or a philosophy in between, Pathfinder Player Companion: Champions of Balance allows you to tip scales in your favour! Make sure your resolve is known by claiming the new options in this book designed specifically for neutral characters - hone your pragmatic battle prowess with new combat feats, overwhelm your extremist rivals with never-before-seen items, and even command opposing forces from the Outer Planes with powerful new summoning magic. Discussions on how to create a huge variety of lawful neutral, neutral, and chaotic neutral characters and inspire neutral heroes and antiheroes. New traits and rules for characters who hail from neutral lands or belong to one of the Inner Sea's various neutral organisations. New spells, magic items, feats, and other character options to embolden adventurers dedicated to the principles of neutrality. New archetypes for bards and druids, a cavalier order, a sorcerer bloodline, subdomains, and more!